Help NYC Audubon protect the future of Gateway National Recreation Area! 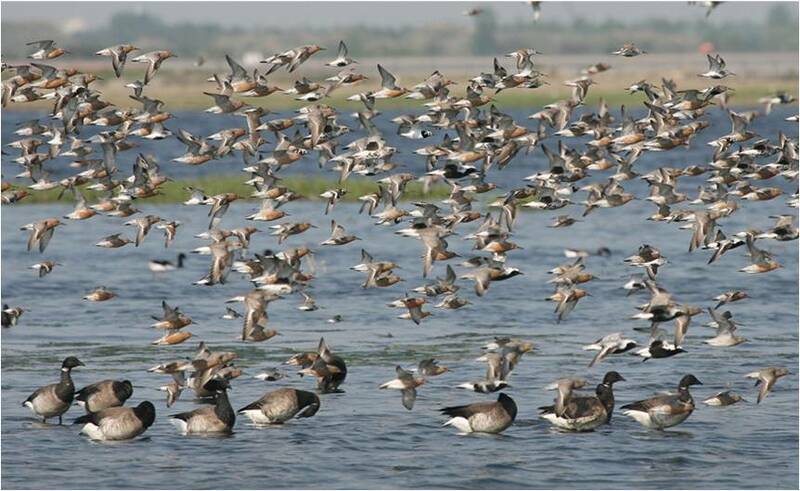 Gateway National Recreation Area, a 26,000 acre park embracing the shores of New York Harbor in both New Jersey and New York contains critical habitat for over 300 species of birds, including over 100 species of conservation concern. Many of those species have shown significant declines in recent years. Please join New York City Audubon in calling upon the National Park Service in the creation of its new General Management Plan to make protection and restoration of wildlife habitat the highest priority. Threatened by loss of habitat and climate change, these species have nowhere left to go in the region, and Gateway must be managed as a last refuge for these species. You can sign our online petition by clicking on this link: change.org. Please sign and spread the word! Clay Pit Ponds State Park Preserve is a little gem of a park toward the southern end of Staten Island that takes its name from the fact huge numbers of bricks originated in its bounteous kaolin clay pits in the 19th century. NYC Audubon, with the support of an Audubon NY TogetherGreen Innovation Grant, has been fortunate to take several groups out to Clay Pit Ponds to introduce them to the history and wildlife of the park and also work to improve the park. 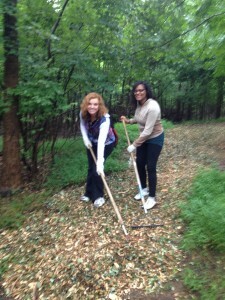 On Friday, July 20th a group of 20 from CBS spent several hours removing invasive plants like Japanese Stiltgrass, placing new woodchips on the park’s trails and cutting back plants encroaching on the trails. On July 23rd and 24th we took two groups of students from our Bronx borough partner Rocking the Boat to the park to walk those very same trails, learn about the history of the area and check out the abundant wildlife in the park. We’ve really taken to Clay Pit Ponds and highly recommend it as a great place for New Yorkers to visit! Great Egrets have been an important species for New York City Audubon ever since they started returning to nest in the Harbor in the 1980’s. 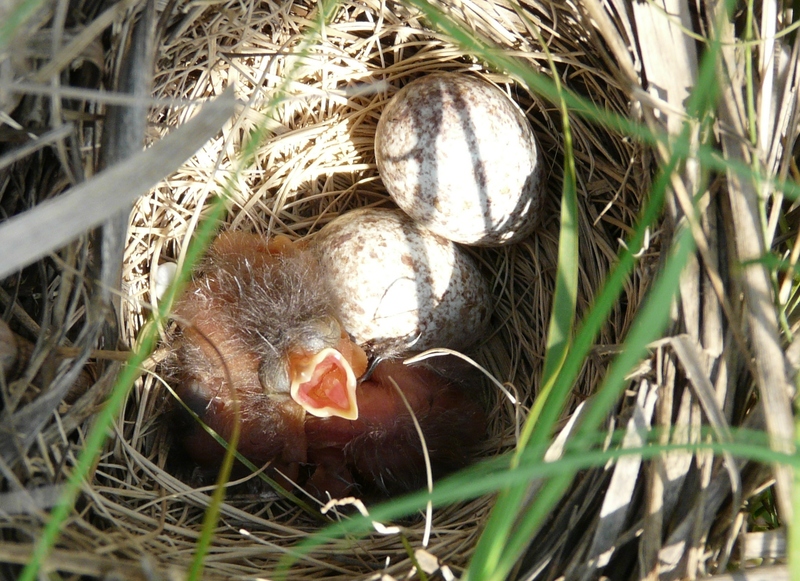 In 2008 we joined forces with New Jersey Audubon, to figure out where the nesting birds were finding food for themselves and their young. NYC Audubon started our banding program that same year. But leg bands on waterbirds can be hard to see – especially when the birds are standing knee-deep in water. 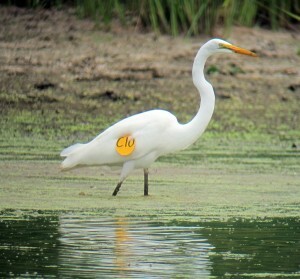 So in June (2012) we started using wing tags on egrets. We tagged 25 birds, young of the year, with yellow tags. We’ve already gotten resighting reports from the New Jersey Meadowlands and from a wetland in Morris County, NJ. 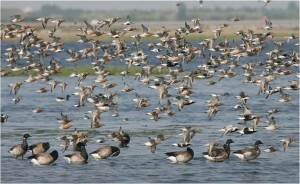 Who would have thought that Jamaica Bay birds fly 30 miles west to forage? Please keep your eyes open for wing tags and leg bands! Let me know if you see one of our NY Harbor birds. This gives the term “hawking goods” a whole new meaning! 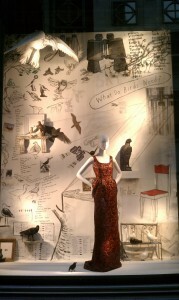 If you find yourself walking down Fifth Avenue between 57th and 58th Streets, you might notice some eye-catching windows at Bergdorf Goodman. The current theme of the women’s display windows is birdwatching and there is some lovely art providing support for the rather willowy mannequins. Donna Evans, a long-time and passionate volunteer for NYC Audubon, painted the backdrop murals in two of the five windows, which will be up through the end of July. In Donna’s own words, “They are the biggest things I’ve ever painted, and they are a scribbly love letter to birds and birding.” We think you did a beautiful job Donna! Kek-burr…. Have you seen a Clapper Rail? 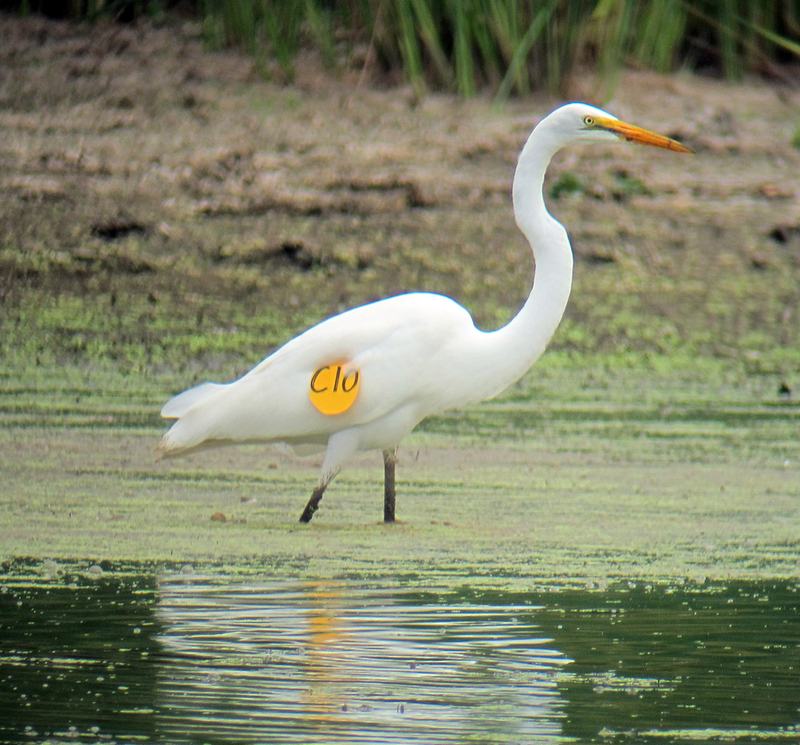 NYC Audubon is part of a multi-state marsh bird callback survey nicknamed SHARP (Saltmarsh Habitat and Avian Research Program), carried out by a network of researchers conducting marsh bird surveys along the coast from Delaware to Maine. On June 22, NYC Audubon Intern Hilary Standish and I took part in a set of surveys on Staten Island; despite the blazing heat, we needed to complete our June survey before the end of the month. (Three surveys are needed, in May, June, and July.) Our team this year is led by Alison Kocek, MS student from SUNY Syracuse, and her crew (Kirsten Thoede and Kelly Long). One of Alison’s study sites is along Sawmill Creek on Staten Island; species found nesting at this site so far this season include clapper rail, saltmarsh sparrow, seaside sparrow, red-winged blackbird, marsh wren, willet, and mallard. Saltmarsh and seaside sparrows are priority species for NYC Audubon and focal species for Alison. She started a sparrow banding program this year to identify individual birds at Sawmill Creek, and she is also tracking nest success. According to the data, nesting on saltmarsh isn’t easy! At Sawmill Creek, only two of six sparrow nests survived the extremely high moon tides in May. A second round of nests has been successful, though, with chicks becoming mobile before well ahead of any extreme high tides. There’s some exciting news as well: This is the first year that saltmarsh sparrows have been observed nesting in an area recently restored for tidal flow. 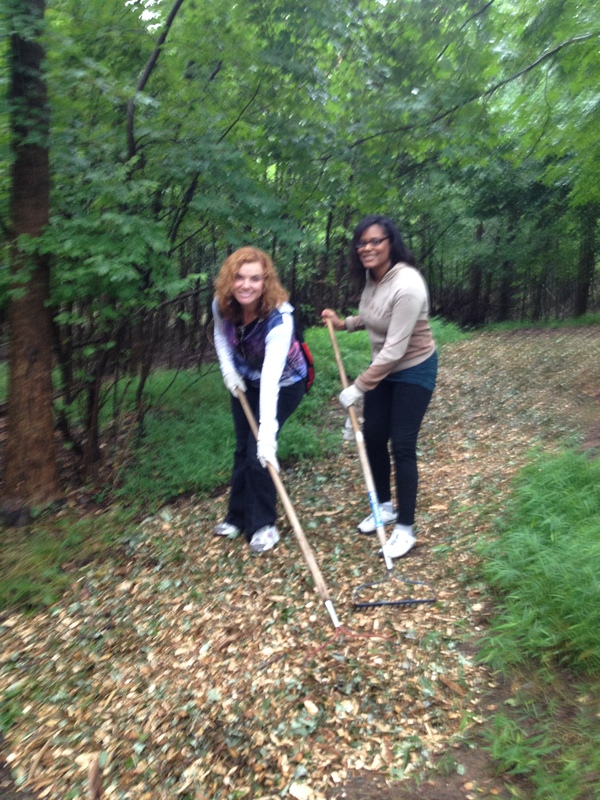 Alison’s study provides important feedback to New York City Parks Natural Resources Group on their restoration efforts. You can read more about SHARP at http://www.tidalmarshbirds.org.